Since 1996, the environmental concerns raised by the community at North Maclean and Munruben have never been addressed. There have been numerous sightings of vulnerable Koalas on and around the property. There have been numerous sightings of endangered Spotted-Tailed Quolls in adjacent properties – these quoll sightings have been the first in the Greater Brisbane Area since the 1930s . Quoll roadkill has been collected from the area confirming the presence of quolls in this area. The proposed site provides valuable habitat for koalas, quolls and other threatened species including the endangered grey headed flying fox, the Swift Parrot and the vunerable Glossy Black Cockatoo. There have been no detailed impact assessments of industry on these vulnerable/threatened species. No frog or reptile studies have ever been carried out. By signing the petition, you are asking Minister Greg Hunt to REJECT the North Maclean Enterprise (Industry) Precinct proposal. You will be giving our unique Koalas, Spotted-tailed Quolls and other endangered/Vulnerable wildlife of North Maclean and Munruben a chance of survival. If this development application is approved at North Maclean, 117 hectares (approx. 289 acres) of koala food and shelter habitat will be totally cleared. The major threat to koalas is the loss of habitat. 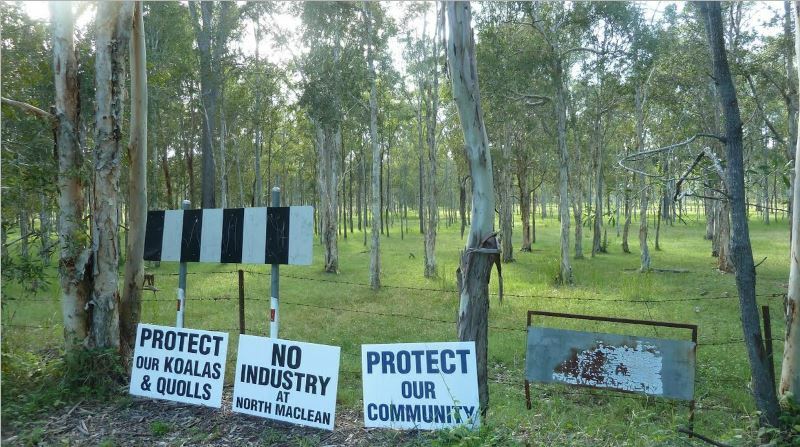 This vast proposed site is only 45% of what is eventually planned for the koala habitat of North Maclean. This current application is a dangerous precedent in the area that should not be approved. The site, owned by Wearco Pty Ltd, is subject to a Federal Government environmental assessment under the Environment Protection and Biodiversity Conservation Act with a decision about the future of the corridor to be handed down on August 31. The site is projected by Logan City Council to bring 27,350 jobs to the area and an estimated $1.2 billion a year to the ­region’s economy. “Jobs” and “economic growth” are eating away at our environment and native species’ habitats.